What Does a Lip Plate Signify? 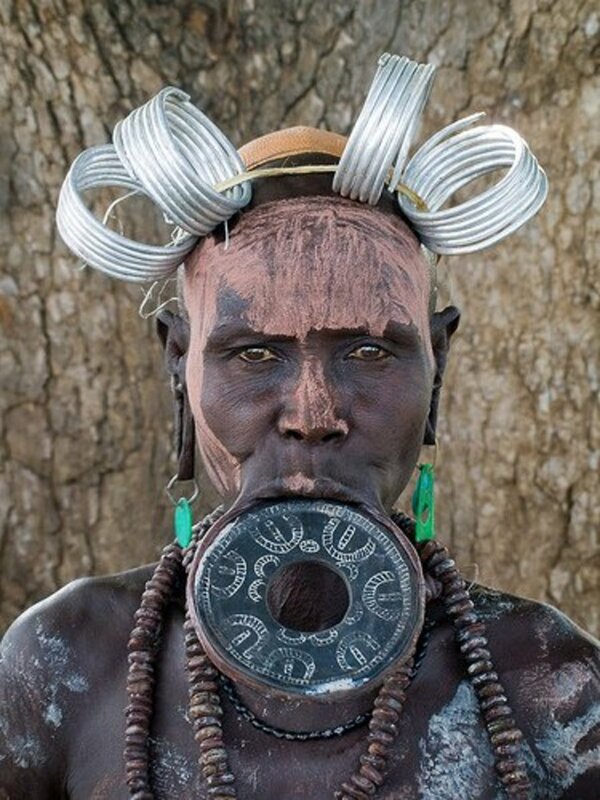 To an outsider, a lip plate may be viewed as a form of body mutilation rather than body art but to a Mursi or Suri woman, it is an expression of female maturity and a sign that she has reached child-bearing age. 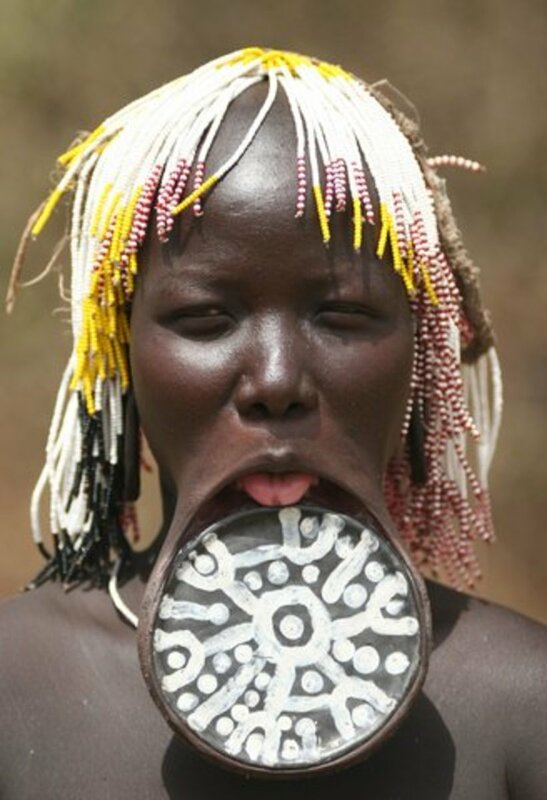 It is also a distinguishing trait that ensures she is not mistaken for a member of neighboring rival tribes who either do not pierce their lips (Kwegu tribe) or only wear small plugs inserted into their lower lips (Bodi tribe). 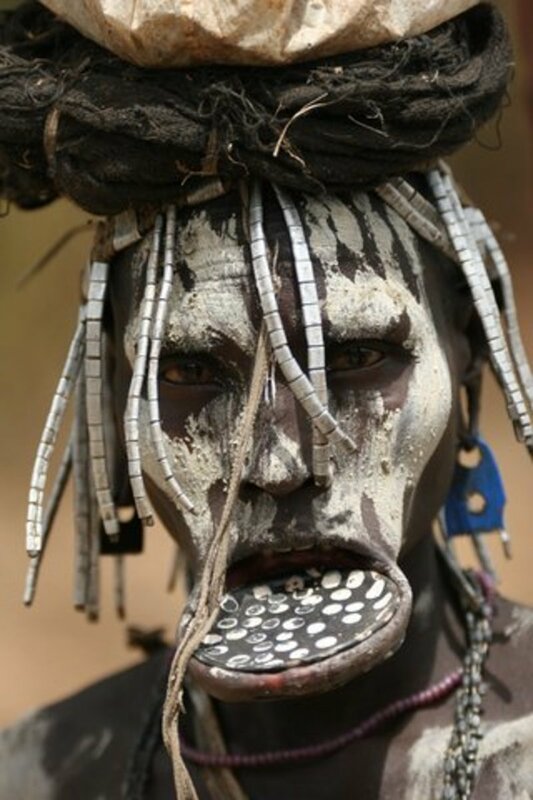 Although labial plates were also traditionally worn by Suya men of Brazil, Sara women of Chad, the Makonde of Mozambique, and the Botocudo of coastal Brazil (quite a mouthful, even without a lip plate), the only tribes that still follow this tradition are the Mursi and Suri tribes of Ethiopia. Who Are the Mursi and Suri Tribes? Close to the Sudanese border in the lower Omo Valley in Ethiopia live a nomadic tribe who number only 10,000 people. 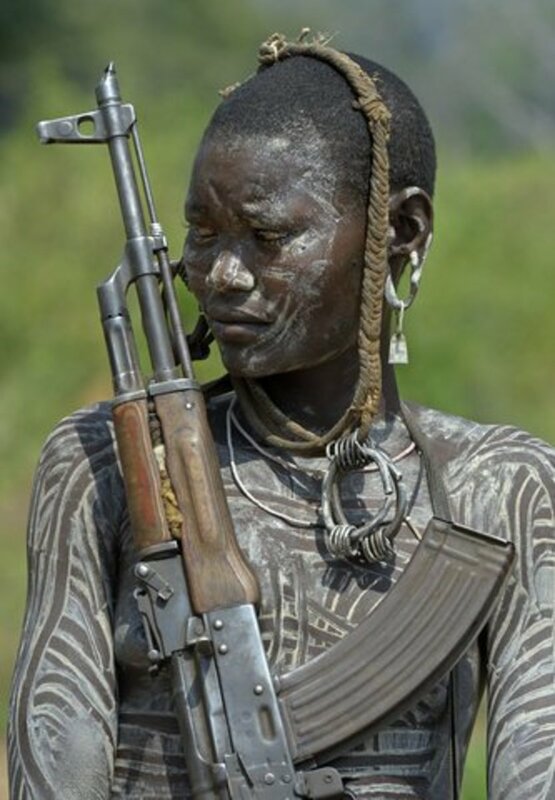 Known as the Mursi, they live in the most isolated area of Ehiopia, surrounded on three sides by rivers. Until a decade ago they were a completely oral tribe as not one of the members could read or write. Lip stretchers are made of wood or clay. How are Lips Stretched and Plates Inserted? This tradition is customarily performed from 6 months to a year before a young girl is to marry, usually around the age of sweet sixteen. During an initiation ritual, a small incision of between 1 and 2 cm in length is made in the lower lip. This ritual is usually performed by their mother or another kinswoman. A wooden peg or ceramic disc is placed in the incision and this remains there for approximately 3 weeks or until the wound has healed. The peg is then replaced with a slightly larger disc, thereby stretching the lip gradually. This stretching process will continue until the lip has an opening of about 4 cm in diameter. At this point, the first clay lip plate will be inserted. To accommodate the lip plate, at least two and sometimes four lower front teeth are extracted. Each woman crafts her own lip plates and decorates them with pride. The stretching process using larger and larger lip plates will continue until a disc of about 10 to 15 cm will fit into the lower lip. There are reports of some women who boast lip plates that are 25 cm in diameter, though this is not the norm. This entire stretching process usually takes several months to complete. This entire stretching process usually takes several months to complete. 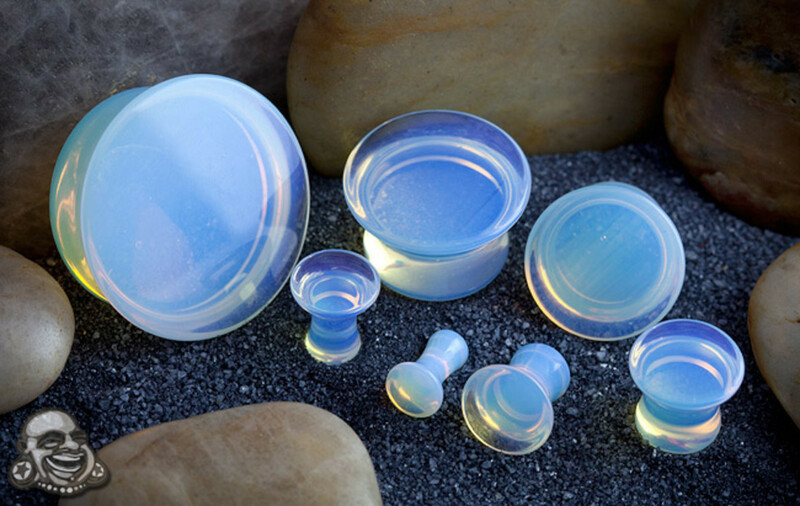 Does the Size of the Lip Plate Matter? It is Mursi tradition that young suitors must pay the father of the bride-to-be when asking for his daughter's hand in marriage. Most of the marriages are pre-arranged with the future bride having little or no say in the matter. Although it is often said that there is a correlation between the size of a young girl's lip plate and her bridewealth, this does not hold water, as the price of the future bride is usually determined prior to the initiation ceremony. It seems that the plate's size is determined by personal preference and the wearer's ability to withstand the pain associated with the stretching of the lip. The Mursi tribespeople view their bodies as living canvasses and paint intricate patterns on all parts of their bodies from an early age. The men paint their bodies with white chalk during dances and ceremonies. Using their fingertips as brushes, the men also paint intricate patterns on each other's bodies with a thin layer of clay from the river bank. Besides adorning themselves with these enormous lip plates, the women also wear white body and face paint. They are also fond of wearing earrings made of fruit on their stretched and cut earlobes. 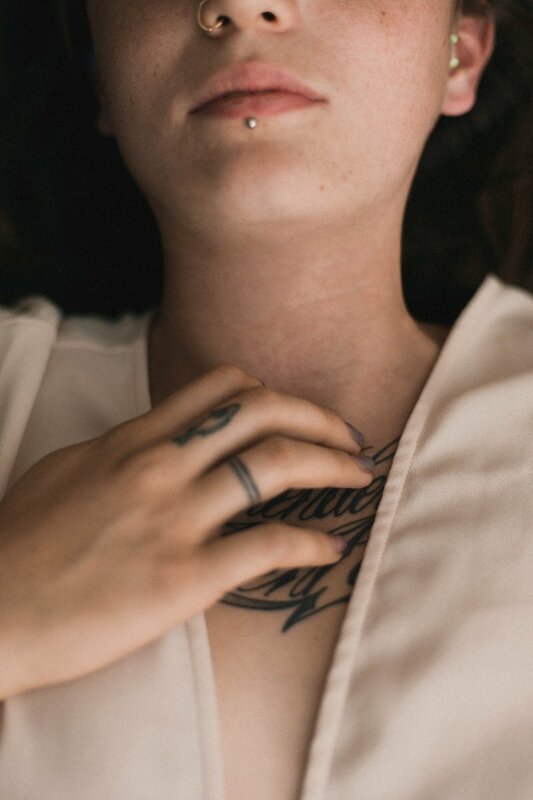 Is This Tradition of Body Art Still Carried On Today? There are pressures on Mursi women from the Muslim-dominated Ethiopian Government to give up this practice. Another indirect pressure comes from the realization by the tribe itself that they will be excluded from social and economic benefits as long as they are perceived to be backward by outsiders. They recognize that the tradition affects other people's perception of their limitations and stands in the way of future development. Tourists, on the other hand, are keeping the tradition alive. They travel great distances to see and photograph these lip-plated women that they presumably perceive as freaks in a freak show. The Mursi have, however, realized that they can earn a living by posing for these tourists and this in itself may be sufficient motivation for them to continue the tradition. The practice of stretching their lips has become an economic asset to the entire community. The Mursi tribe will probably eventually have to heed the government's warnings, but until then, the tourists will keep coming. The article fails to explain why lip plating is just as prevalent among African men. Go ahead, google images for "lip plate," and just as many images of men with huge lip plates pop up. 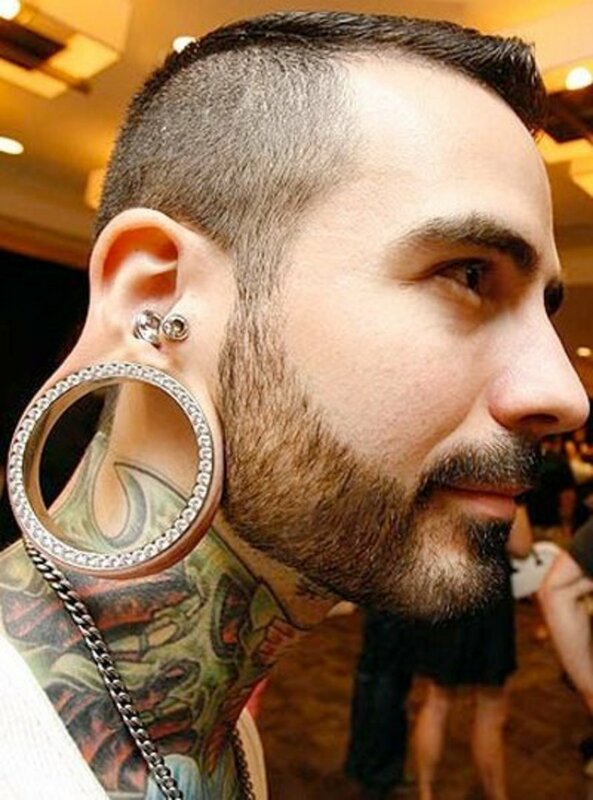 The sad thing is people in the United States will do stuff like this calling it Gauging. 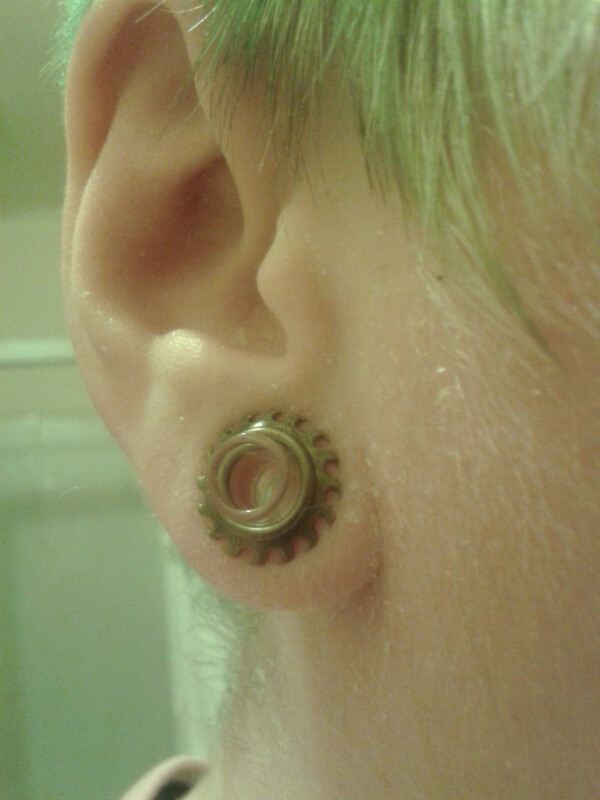 Another thing is most places won't hire people that have their ears gauged or even lips gauged. 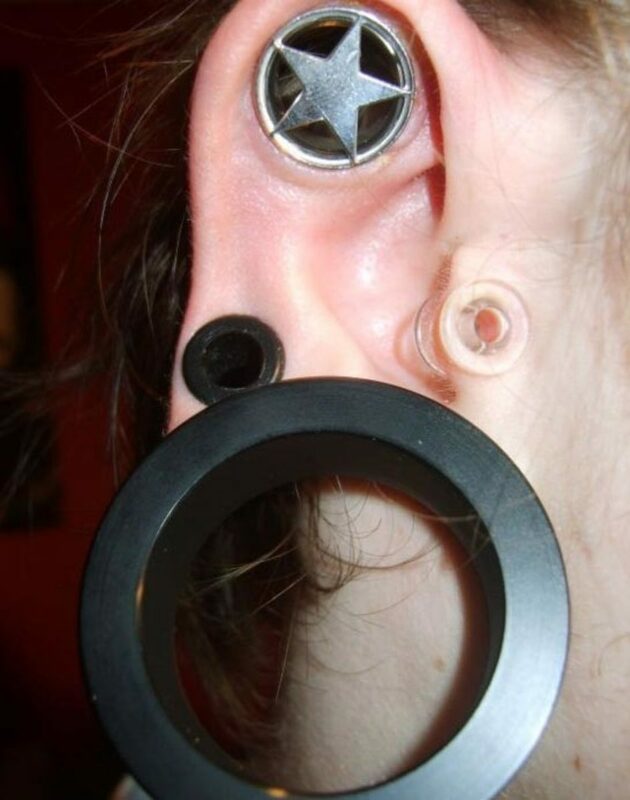 there are people that go so far a gauging their noses. They do this and they nearly ruin the whole perspective of where it originated from to where it has lost its meaning. they do stuff like this cause they think it is "cool". I'm sorry but their is a difference between apreciation and apropreation. I think people have to keep in perspective that various kinds of body mutilation have existed throughout the history, on both men and women. It's just that our societies have evolved and mostly got rid of them, so we find such things uncommon. It's certainly not only about women at all. In a lot of cases those performed on men were much more brutal. Some scholars believe that the plate is really more about gait than the ability to talk, and indeed I doubt anybody would find somebody unable to talk "attractive" at all. Anyways, I really doubt that in the modern era any sensible woman would still "prepare her own plate" with any kind of happiness. This will also gradually get phased out as our societies evolve. This is a great hub...informative and eloquently written. However open I perceive my own mind, though, it clamps right shut when I look at these pictures. In short, I think these traditions are hideously stupid, completely and obscenely debauching the innate, stunning beauty of these indigenous women. I take any challenge seriously including my writing of Hubs. I enjoy the research as I love broadening my knowledge base. Thanks for dropping by and for the kind comments. It seems to me that you put a lot of planning and research work into this Hub. You're taking your work here seriously; very well done. Thanks Habee and I agree - it does look pretty painful! Great hub! But it hurts me to look at the pics...lol! Maybe its the money that the women are getting from the tourists that make the lip plate an attractive form of body art. Some of the Mursi women do wear plates in their ears but it is not as common as a lip plate. Apparently the process of stretching the lip is painful but once stretched the actual wearing of the lip plate is more a nuisance when it comes to eating, drinking and talking. I saw a documentary about this people in National Geographic. 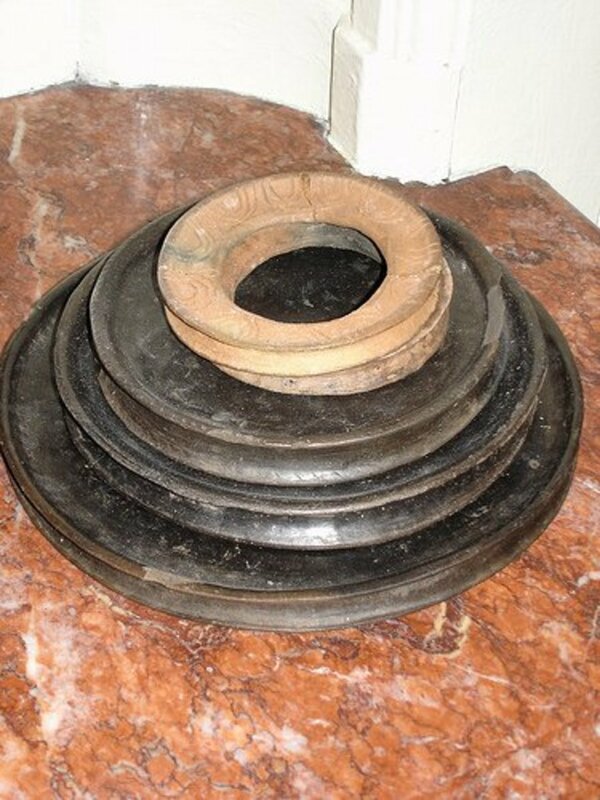 Other than lip plate, I think one tribe also put plates in their ears! It's kind of strange seeing them wear it (and painful too!) but if it works for them, it works for them =). Thanks Catherine R and I agree Ouch! Nice catchy title! But ouch. I suppose that if you put it that way it is not any worse than having breast implants! If it looked attractive it may still have been worth it. That looks painful... I am just happy that I was not born in one of those nomadic tribes.